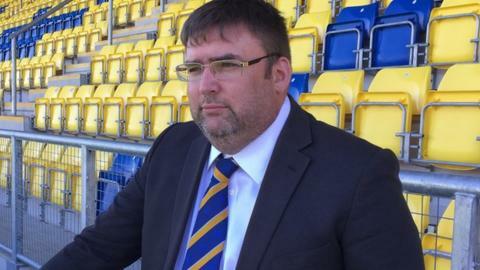 Torquay United chief executive Steve Breed says the club is "making headway" on the legal claims which could force the club to fold. Last week, director of football Dean Edwards exclusively told BBC Sport that claims by former employees "could finish the football club". Breed was part of a consortium which took over at Plainmoor in the summer. "All I can say on the legal process is that we're making a lot of headway on these matters," Breed told the BBC. "Hopefully things are being resolved, and a couple have already been resolved, so that's good news for the football club. "We will, when we get all the things done, let the supporters know where we are in the process." The consortium was forced to make drastic cuts to the National League side's budget following their takeover, with the club's academy being closed as part of their drive to lower costs and part of the training ground leased to Plymouth Argyle for use by their youth team. "There's a lot of stuff that we've had to sort out that was left over from the previous regime," added Breed. "We never pretended that this was going to be easy - we never came into the club and said we would be winning the league this year. "But even to just get a set of fixtures for the National League this year was an achievement and we wouldn't have been there if it wasn't for the people that we brought into the football club to take it over, and that has to be respected and remembered." And Breed says the club is considering moving matches to Friday or Saturday nights in a bid to increase crowds, which have dipped to below 1,600. "There's a lot of people that play football on a Saturday and we'd be trying to encourage some of those players that play in those leagues to come and support the club on a Saturday night," he said. "We'll look at every available opportunity to bring finances to the football club, and that's what we're doing. We can't afford to rule anything out."